The Peloponnese presents the ideal combination of beautiful nature, historical monuments, cultural attractions and good cuisine, making it a unique Greek destination. THE PELOPONNESE has based its economy on its two major agricultural products: raisin and oil. The cultivation of raisin, the famous currant — known as the “golden gold” during the 19th century—was for the Greek economy what coffee was for Brazil and amounted to 70% of the total value of its exports. The Peloponnese is gastronomically divided into seven sub-areas (Corinthia, Achaia, Ilia, Messinia, Laconia, Argolida, Arcadia). These areas present different microclimates, unique cultivations and, of course, separate kitchens; however they also share some common elements because of proximity. THE ORANGE GROVES of Laconia, along with the ones in Argolida and Corinthia, are the largest in Greece. In Laconia, orange is used to flavour sausages, cured meat, corned beef, olives and is often included in salads or sweets (i.e. orange pie). Messinia and Laconia are famous for their extra virgin olive oil—of the Koronean variety — considered to be one of the best in the world, and their mountain tea from Taygetos, while the Kalamata olives are probably the best known of Greece. Other well-known products of Messinia are white cheese, such as sfela and feta, honey and sesame which are used to make pasteli (a sesame seed candy), the dried figs of Kalamata, the mulberries and the Vatikiotika onions. IN MOUNTAINOUS ARCADIA located in the centre of the Peloponnese, as well as in the highlands of Argolida, Corinthia and Achaia, there is livestock farming with notable cheese production, such as the Trageas gruyere and the famous Kalavryta feta cheese. Honey is also produced; with the honey from Elatis-Parnona being the most known, as well as apples—the Pilafa apple variety—, and chestnuts, as in the famous Parnonas chestnuts. THE BASIC PRODUCTS of the region are complemented with two varieties of eggplant: the flaska in Argos and the famous PDO Tsakonian eggplant from the fertile valley of Leonidio, along with the artichokes of Argos. In the region of Ilia, agriculture flourishes with the crops of tomato, strawberry and watermelons being among the most important cultivations. SPECIALTIES OF THE PELOPONNESE: lamb with artichokes, rooster with pasta, apricots with tsipouro, zucchini pie with raisins, pig with grape treacle, pig on the spit, Nemea tagliattelle with flounder, boiled goat with spaghetti, black eyed peas with spinach, Monemvassia mullets, cod ragout, kagianas (omelette with cured meat “syglino”), strapatsada, Manis lallagia, Laconias broustoula (a delicious pie made from bulgur wheat, trachana, milk, savory and honey), galopita (a sweet pie with milk and eggs), and diples. The Peloponnese is the geographical region of Greece that produces the largest quantities of wine in the country and where two of the four most famous local wine varieties are cultivated. The “ambassadors of Greece” abroad are Moschofilero and Agiorgitiko, from the areas of Mantineia and Nemea respectively. The vineyard of Nemea with its 40 wineries resembles Tuscany, while the vineyard of Aigialeia with the Corinthian currant and the Rhodian variety being its major crops, overlooks the beautiful Corinthian Gulf. Other varieties grown are Assyrtiko, Kydonitsa, Monemvasia, and Muscat. Dozens of taverns in mountain areas and hundreds of fish taverns use local ingredients and offer delightful gastronomic surprises to their guests. 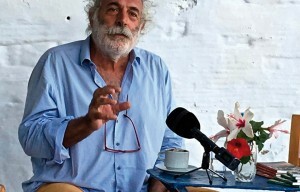 George Pittas is the author of six books of travel gastronomy and the owner of a hotel complex in the island of Paros. He is also a board member of the Chamber of Greek Hotels, head of the Greek Breakfast program which aims to connect hotels with the gastronomic wealth of their own districts, so that hotel customers, prompted by the breakfast buffet, become familiar with products, recipes, places and producers. George Pitas travels all over the country, having already created 41 characteristic Greek breakfast patterns. The Greek Gastronomy Guide www.greekgastronomyguide.gr is a website that aims to inform its visitors about all the values and products of our gastronomic culture. Places and landscapes, products and people, history and tradition, happenings and rituals, markets and entrepreneurship, flavors, recipes and local cuisines, regional taverns and traditional cafes… All unfold in such a way that each region becomes a gourmet destination, encouraging visitors to identify and appreciate not only their famous culinary attractions, but also the others; the little-known secrets hidden in each.